The weather is turning cold, the kids are turning restless, and since we were talking about nonfiction books in the library, I read fiction for storytime. Although, for one week I did return to what is becoming one my favorite themes: inventions. We talked about the importance of the text and the illustrations in a picture book and how they work together to tell the story. We also talked about the possible endings for Sam and Dave Dig a Hole. Mr. Ferris and His Wheel by Kathryn Gibbs Davis, illustrated by Gilbert Ford. We talked about the first skyscraper in 1885 that rose 10 stories high and skyscrapers today that reach up over 2,000 feet. We marveled at Ferris wheel passenger cars that held 40 velvet seats. Joha Makes a Wish: A Middle Eastern Tale by Eric A. Kimmel, illustrated by Omar Rayyan. I asked, "If you had one wish what would it be?" 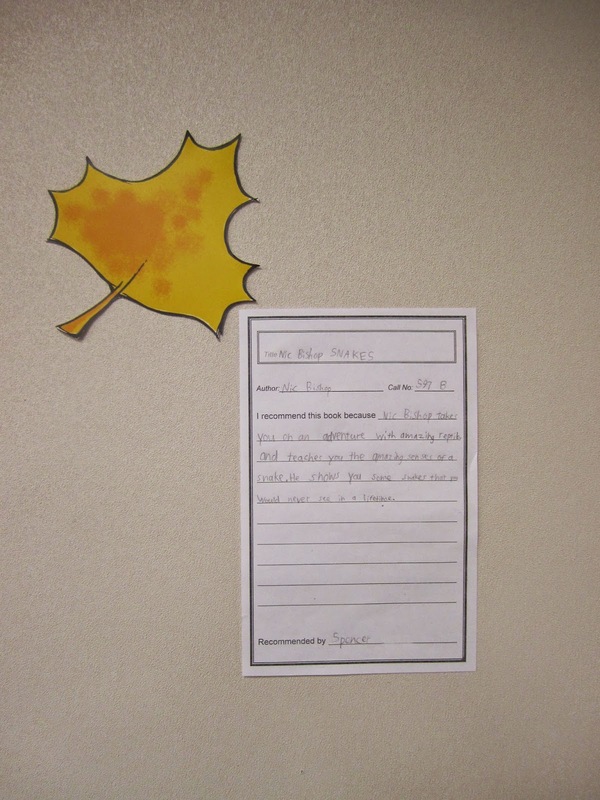 One student wanted to fly, another wanted to be rich, and then there was my favorite: "I would wish to be a shape shifter." We had a great month reading and re-reading the animal books in our library, and as we wrap up our Fabulous 590s, we consider, Was it a success? Every book we booktalked was checked out and some now have multiple holds on them. We filled our wall with student recommendations. Students crowded around our 590s section and left our shelves depleted. 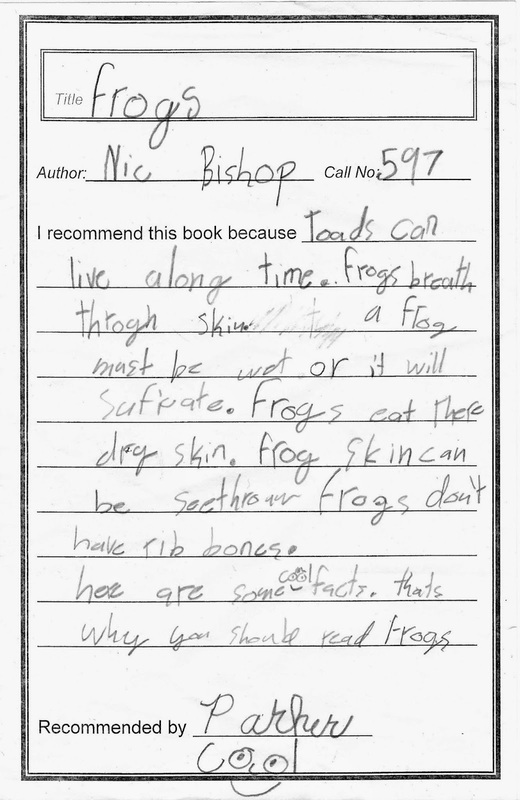 But the real questions in my mind are these: Will students choose nonfiction books for leisure reading in the future? Will they continue to check out these excellent books in the months ahead? Will the current enthusiasm build into a life-long love for some students? Here's hoping the answers are Yes! Two weeks into the event, our shelves are looking bare. You can find previous Fabulous 590s posts here, here, here, and here. Did you know that the most deadly animal to humans is the mosquito? Did you know that one of every four animals on earth is a beetle? Did you know that when black widow spiders hatch, they begin to eat their brothers and sisters? 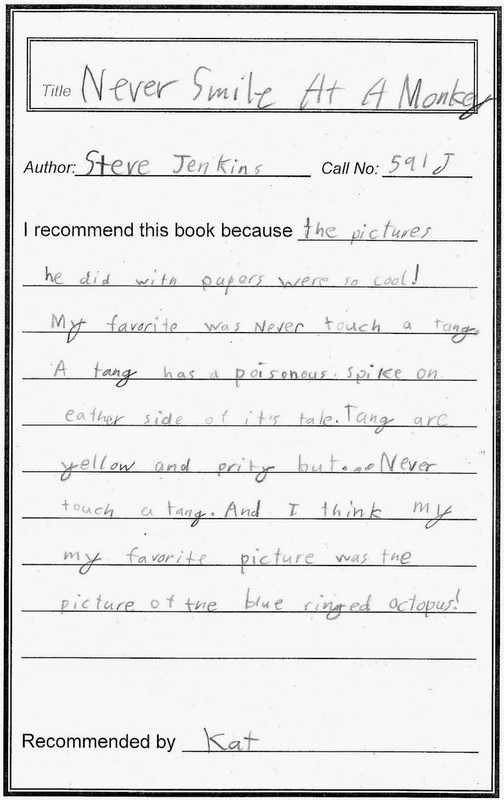 You can find these amazing facts and many others in Steve Jenkins's books. We have a dozen titles by Steve Jenkins in our 590s, and we talked about them all. 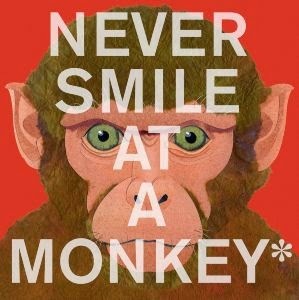 No book was more popular than Never Smile at a Monkey which now has double-digit holds. 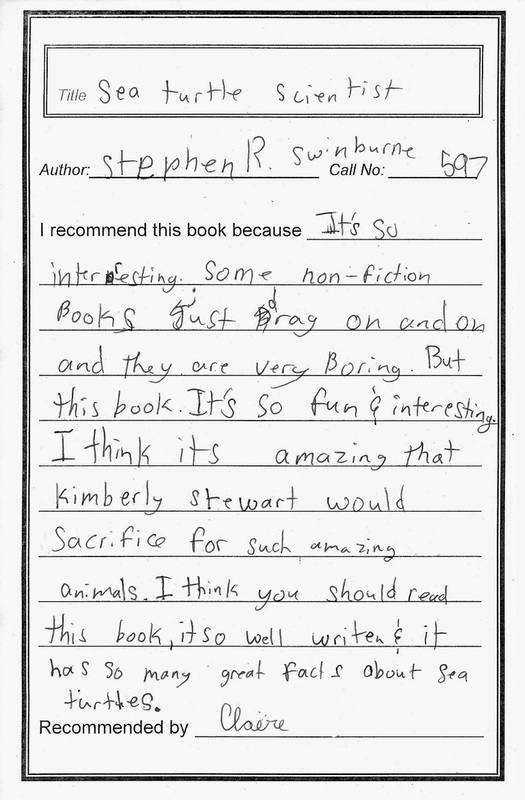 I shared it with a third-grade class, and before I made it through the first page, a boy had a question: "This isn't nonfiction--these are just supposed to be funny, right?" After assuring him that it was all true, I continued, but still got a few incredulous looks. Jenkins is a master of paper collage, and to my mind, one of his most striking pictures is the Siberian tiger in Actual Size (a title we pulled from our picture book section for this event). We looked at the fur, the eyes, and the amazing detail as we talked about how Jenkins makes his pictures. Nothing sums up the overall feeling as well as the comment made by a boy who was flipping through the pages of his book as he waited in line to check out: "I can't believe he made these with paper!" Laser detectors, flash guns, and hand-built shutters help Nic Bishop take phenomenal animal photos, but that's probably not what readers are thinking about when they pick up his books. In fact, the photos are so captivating that you don't really think about a person being involved in their creation at all. Instead, each feels like a unique story that you have happened upon just by turning a page. Whether it's a baby koala waiting for his mother to wake up, a snake swallowing an egg, or a basilisk darting across a pond, Nic Bishop's photos express the action and emotion of you-are-there moments. 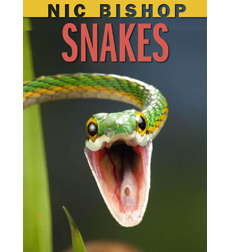 Nic Bishop has a great website with information about his photography, his research, his books, and his life. These resources, combined with the notes at the back of his books, make booktalking his books a cinch. "Yes," I assured her, "He took them all." "Really? Even for the spider book?" 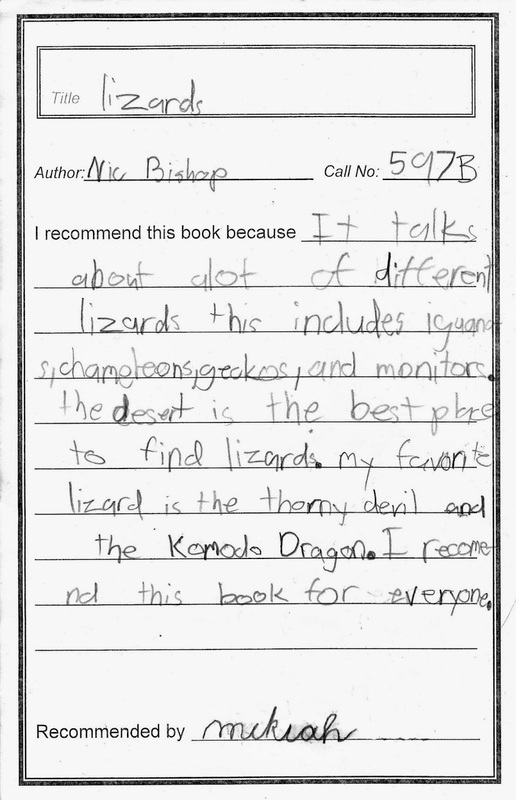 "Yep, even for the spider book." I quickly changed my plan for that class and began telling them how Mr. Bishop had kept several of the spiders in his home and had even taken them "on holiday . . . if they needed special care". 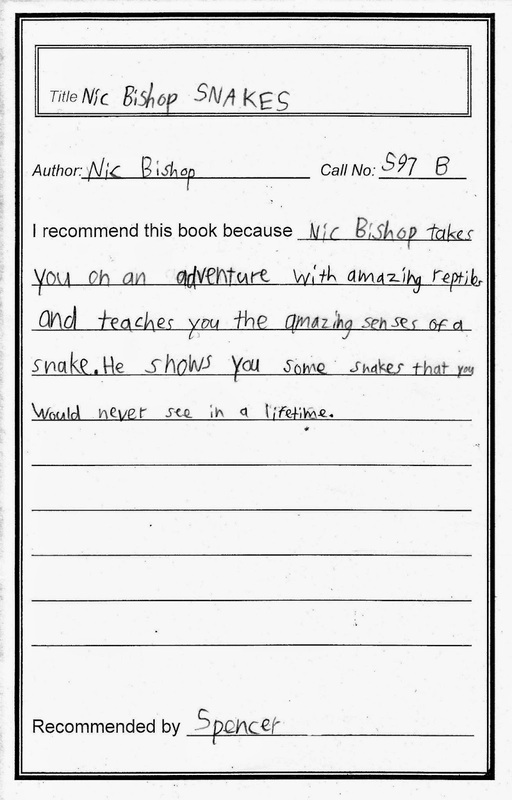 Then I opened Nic Bishop Spiders to the title page. That same girl took one look at the gorgeous crab spider camouflaged on goldenrod flowers, and her hand shot up again. "Did he take THAT picture?" "Yes, he took that picture." Almost unbelievable . . . but true. Naming the Best of 2014 -- Lists! It's that time of year when "best of " lists start popping up, and I love them! The winners of the New York Times Best Illustrated Books for 2014 were chosen by an illustrious panel of judges--Jennifer M. Brown, Brian Floca, and Jerry Pinkney. The ten titles on the National Book Awards Longlist for Young People's Literature were announced clear back in September. And the finalists on the shortlist were announced in October. Congratulations to Jacqueline Woodson and Brown Girl Dreaming for winning the award this week. Click here to read the lists, the winners, and interviews with the authors. Publisher's Weekly has announced their Best Books 2014 lists. Check out the choices for Picture Books, Middle Grade, and Young Adult. This is the list that convinced me to finally pick up The Witch's Boy--oh, so good. One of my favorite lists of the year is School Library Journal's: Picture Books, Middle Grade, Young Adult, and Nonfiction. I was thrilled to see My Grandfather's Coat, Firefly July, and Rules of Summer on both PW's and SLJ's lists. I also heartily agree with the inclusion of Revolution, Ophelia and the Marvelous Boy, Brown Girl Dreaming, The Port Chicago 50, and The Family Romanov--best books all! And now I really need to find a copy of The Crossover. We kicked off our Fabulous 590s program with the fabulous Scientists in the Field series. 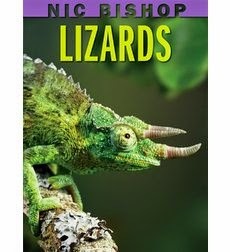 This series provides a diverse glimpse into the animal world--tapirs and tarantulas, kakapo and cheetahs, snakes and seahorses--by following scientists at work. 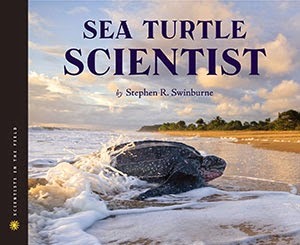 Engaging texts and stunning photography take readers right into the scientists' explorations as they ask questions, search for answers, overcome obstacles, and make discoveries. Booktalks for twelve of the thirteen Scientists in the Field titles in the 590s section of our library were received with plenty of oohs and aahs, particularly when we showed photographs of the kakapo and the tree kangaroo. After two days, all of our 590s Scientists in the Field books (including Kakapo Rescue which we moved from 639) were checked out. My favorite moment was when two girls grabbed Project Seahorse at the same time and sank down to the floor, side-by-side, and began reading it. They were so engrossed in the book that when one of them finally glanced up, she was startled to find the library empty and her class halfway down the hallway. 'Cause these books are just that good. You can get more information on Scientists in the Field books here. For updates on the research explored in the books, subscribe to Adventure Notes. 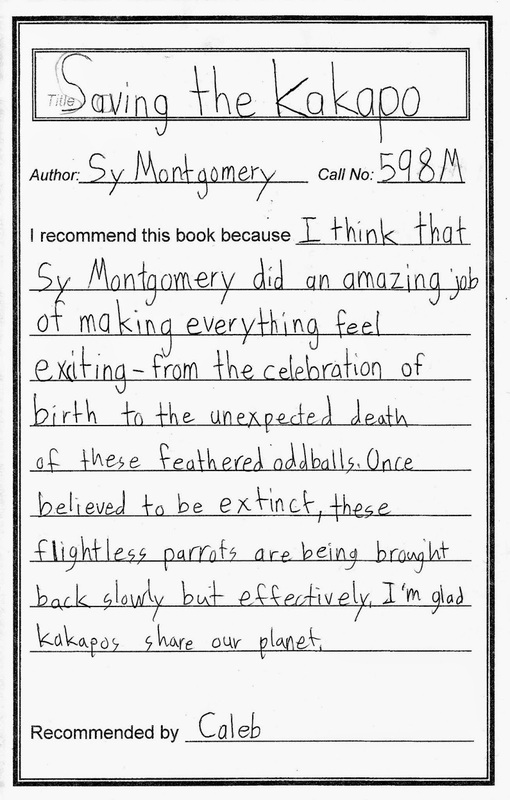 And oh, I can hardly wait for Octopus Scientist by Sy Mongomery--coming next year! A couple of years ago, I came across a book that felt different and quirky - in a good way. At first glance, you are not sure if you should love it or not, but it won me over with its enthusiasm and personality. This book was Oh No, George! 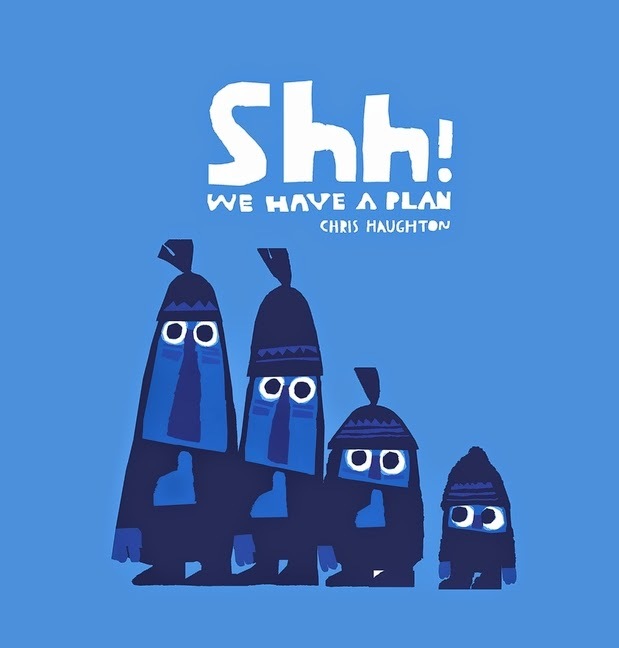 by Chris Haughton. Now, Haughton has a new story that showcases his unique style. Shh! We Have A Plan features four friends out for a walk in the dark woods. They are carrying nets and they "have a plan." Predictably, the littlest adventurer has a plan of his own - one the other three won't listen to. Their persistence in trying to reach their goal is amusing and the build-up to the twist at the end is rewarding. Blue and black tones dominate the pages with just a punch of red to draw your eye. Blocky characters manage to have personality without extensive detail and the eyes especially are able to convey anticipation, frustration and surprise. There are just over 100 words in the entire story, so the magic really is in the humorous pictures and well-paced adventure. The premise is simple enough that my four-year-old can recite it perfectly with minimal prompting and the repetitive cadence invites participation from even the oldest audience. 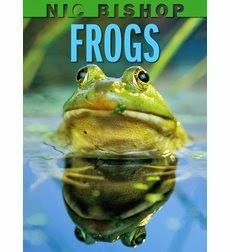 This is definitely a bedtime story that will be well read and loved because of its brevity, unique pictures and delightful story. Lions and Tigers and Bears . . . and Lizards and Spiders and Turtles and Tapirs . . . I don't really read nonfiction. Nonfiction is just not my thing. I haven't read that--it's nonfiction, right? I can't count the number of times I have heard variations of this sentiment recently. 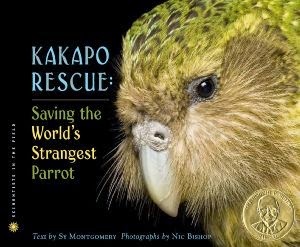 And as I was listening to Sy Montgomery (Kakapo Rescue, Chasing Cheetahs) speak at a conference this summer, I thought, Why? Why are these captivating books so often dismissed? Are we as enthusiastic book talking nonfiction titles as we are talking about the newest fantasy series? 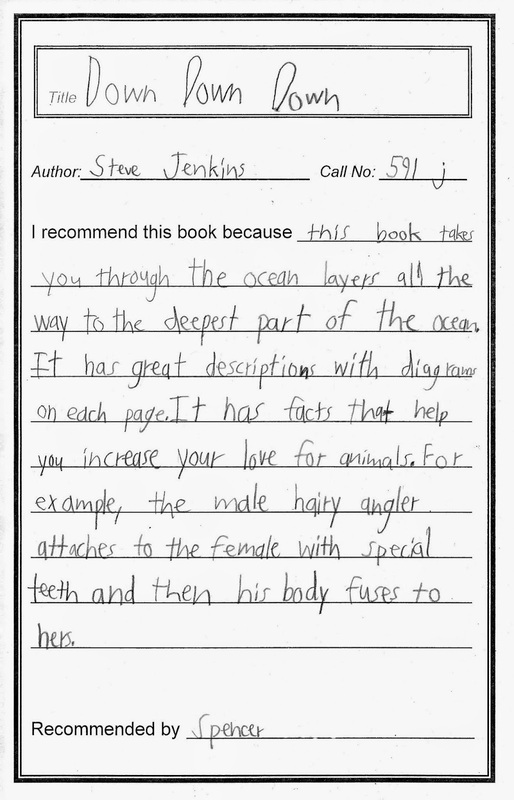 What can we do to get our students excited about nonfiction? 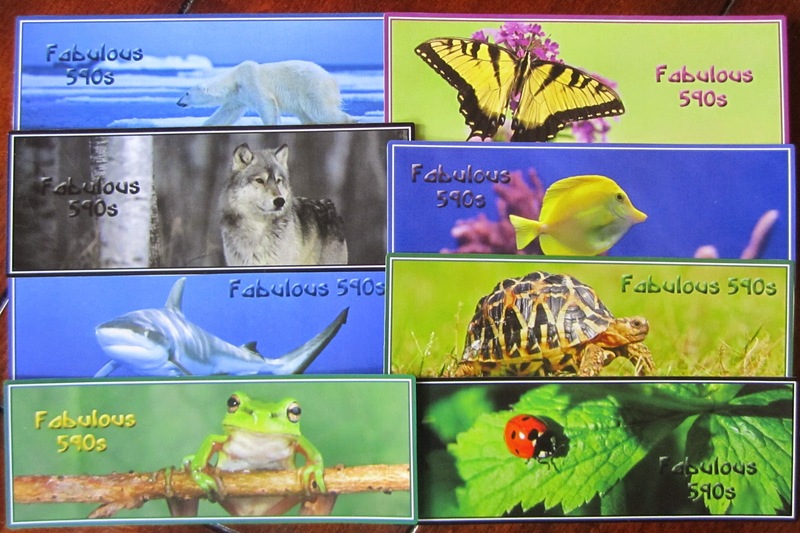 So, at our library, we have decided to celebrate nonfiction during November with an event called The Fabulous 590s. Throughout the month we will be spotlighting many of the books from our 590-599 shelves. And because nothing can rival the power of peer recommendations, we are encouraging our students to write about their favorite books. 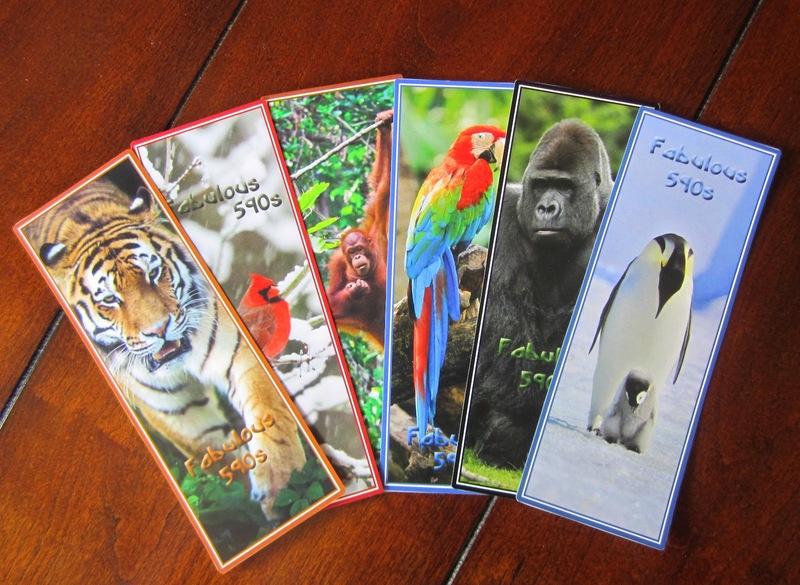 Bookmarks for students who recommend books. We are looking forward to a great month sharing fabulous books!